Not all health club websites are created equal. 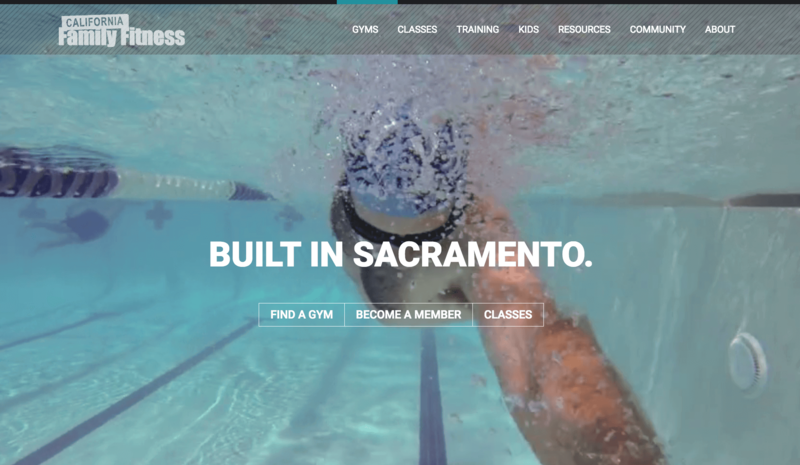 That definitely rings true in this case for Sacramento-based gym California Family Fitness, a thriving regional club with 19 locations who just launched the first website of its kind in the health club industry on the Hubspot platform. What makes their new digital digs so different and unique? WindFarm Marketing designed the site from the ground up to not only be bold and beautiful, but also to dominate the search engines and generate more inbound leads than ever before. How did we do it, you ask? Here’s a breakdown of the eight latest lead generating trends, tactics, and technologies we built into their brand spankin’ new site to help increase conversions. Over the last few years, California Family Fitness has seen their mobile traffic spike sharply, even taking over desktop traffic in 2014. With the rise of Internet accessibility and smartphones, it has become a digital trend experienced across all industries. 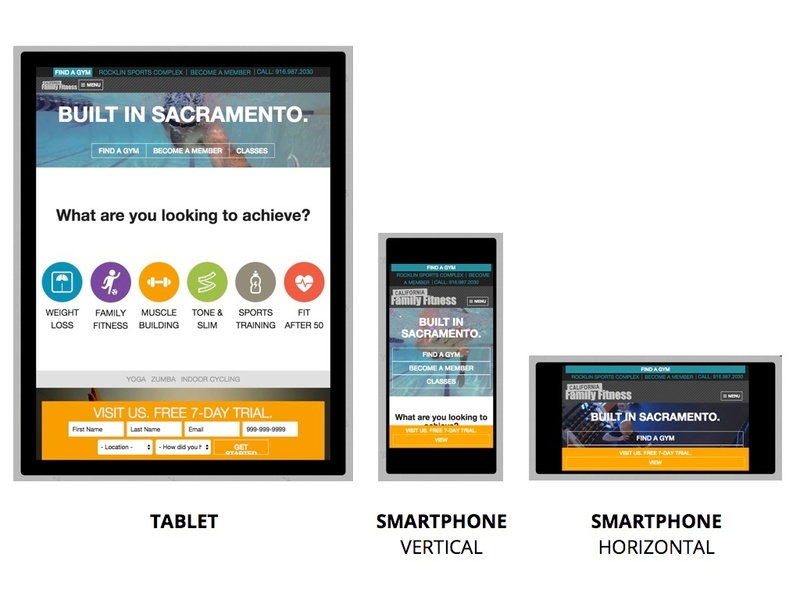 While most health club marketers were content with displaying a “mobile-version” of their site that needs to be maintained separately from their actual site, the folks at California Family Fitness were not. Launched in time to capitalize on Google’s latest Mobilegeddon update penalizing competitor sites that aren’t mobile-friendly, their new site automatically detects the type of device a visitor is using to access it and then displays the entire site in a way that is appropriate to that specific device. Whether on a desktop/laptop, tablet, or smartphone - the experience is a clean and unique experience. And, it’s only one version of the site that needs to be maintained instead of two. The team at California Family Fitness recognized the consumer buyer’s journey has changed and noticed that the way most of their health club peers market and sell has not. They shifted their traditional advertising budget which used to fuel expensive television commercials, direct mail, and print ad campaigns over to channels today’s consumers prefer to engage in online such as mobile, search, and social. They’ve been busy the past five years expanding their presence in those channels, including Facebook, and have attracted thousands of interested prospects (not just members) into them. In the last year or so they increased investment in creating and promoting digital content into those channels to generate leads and help answer the questions their prospects and members are asking at every stage of the buyer’s journey. As a result, a proliferation of blog posts and premium content (such as ebooks, checklists, workouts, and guides) have been developed and incorporated into their new site to begin drawing new prospects in while providing the inspiration, information, and motivation at each stage of their journey until they are ready to become members. All of this channel expansion and content development has created a strong foundation for launching the new site (which happened on September 1st). The purpose of the site is to become the “home” or centerpiece of their inbound marketing strategy, and is designed to generate high levels of traffic, leads, sales, and loyalty for years to come. The new site is built on and directly integrated with HubSpot, the same platform that powers the brand’s marketing database, social outreach, blog, SEO, email, and overall content marketing efforts. At first glance you’ll notice how clean and evenly spaced the site layout is. WindFarm designed it that way on purpose and was careful to remove all the clutter and “noise” that normally gets in the way of a person being able to easily find what they are looking for. This creates a pleasant experience for the user and allows them to easily interact and engage with the content that’s most meaningful to them. You’ll also notice a special section on their homepage just below the top module asking visitors, “What are you looking to achieve?.” The strategy behind this is to quickly identify the main fitness goal of each visitor and to engage them into the content and resources the brand offers for people who share that specific goal. Because not every visitor is the same, nor do they all have the same fitness goal or motivation, it was important to California Family Fitness to build a site that engages people where they are at in their specific fitness journey. By offering each visitor the resources right up front to help move them forward on their goal, it should increase their desire to get healthy and join their gym. WindFarm calls them “Persona Pages.” Each one is designed to not only attract and segment their audience, but to convert them into a marketing qualified lead once they download one of the premium content pieces toward the bottom of the page that supports their goal. Upon downloading the guides, visitors can opt-in to receive relevant and informative emails (and offers) that align with their goal, allowing the brand to continue engaging, building trust and interest. 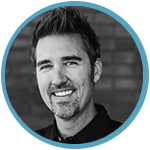 The persona pages are not only designed to be helpful for prospects, but members too. Most health clubs seem to have “tunnel vision” when it comes to lead generation on their website, only promoting one bottom of the funnel offer such as a Free Trial. This kind of offer is important to have and promote on the site for obvious reasons, but the majority of people who visit a health club’s website are not necessarily ready to join today. As a result, only promoting a single conversion opportunity aimed at the “low-hanging fruit” is one of the reasons they may be losing leads in their health club marketing funnel. This site was designed to prevent that. To keep California Family Fitness from missing out on the opportunity to engage these prospects who are higher in the funnel (interested but not ready “join now”), WindFarm developed a Resources section of their site that includes the blog and a premium content library full of downloadable ebooks, checklists, workout plans, and guides for specific personas and every stage of the buyer’s journey. These resource downloads are the secret behind allowing the brand to convert passive website visitors into identifiable prospects (marketing qualified leads). Once a lead, they will be nurtured via automated email workflows and into becoming sales qualified leads to pass on to their sales team. Landing pages are vital to generating leads on a website. Typically, a landing page will offer something of value in exchange for capturing contact information. 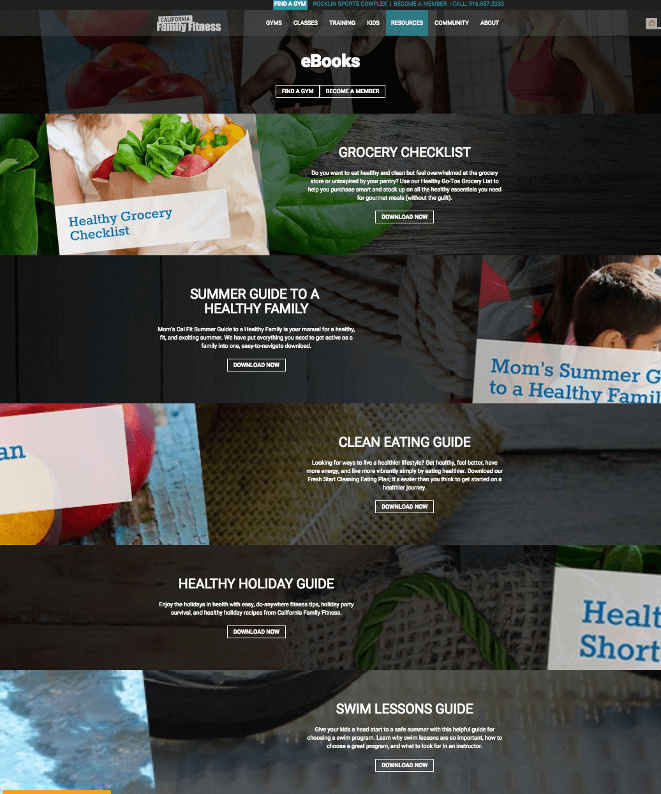 The previous site for California Family Fitness had under 5 landing pages designed to convert someone into a lead, mainly one, their Free Trial landing page. With the new premium content resource library they now have over 10 landing pages designed to convert a visitor into a lead and plan to continue adding more over time. Companies with more landing pages generate more leads than those with less landing pages. How much more? 30+ landing pages generate 7 times more leads than those with 1 to 5 landing pages. 40+ landing pages generate 12 times more leads than those with 1 to 5 landing pages. Every blog post the brand has published on their new site has become a lead generation opportunity. Each blog post is optimized for SEO, indexed by the search engines, and will continue to produce traffic and leads over time as a result of embedding a call to action (CTA) at the bottom of every post. Their new site features Smart CTAs that promote special offers or pieces of premium content that specifically relate to the topic of the post. Targeted or Smart CTAs convert 42% more visitors than untargeted or basic CTAs. Here’s an example below of a post about eating clean on a budget. 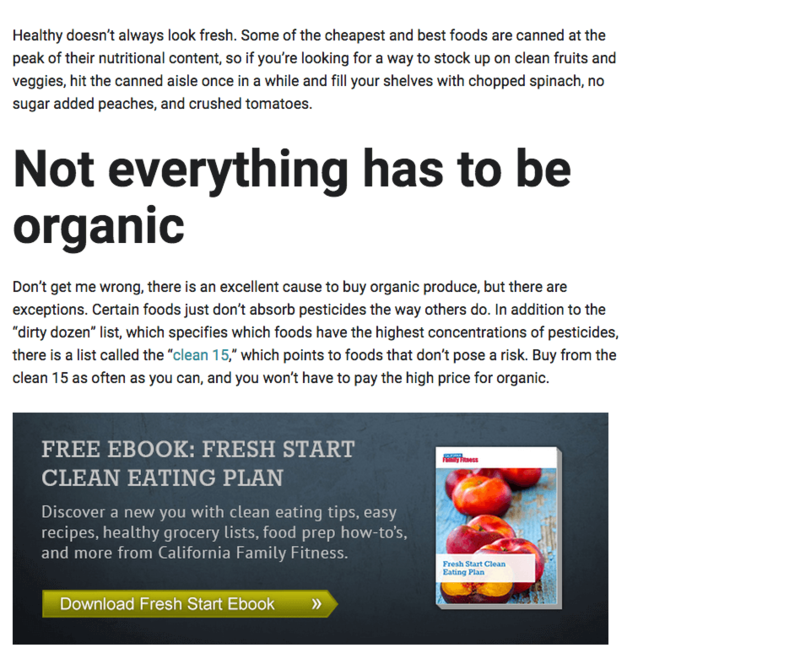 Notice the graphical Smart CTA at the bottom of the post promoting the brand’s “Fresh Start Clean Eating Guide” premium content download. Once leads come into their database, the HubSpot marketing platform can use powerful email marketing automation features such as progressive profiling and Smart Forms that collect data overtime and build a profile for each contact. Each time the user completes a form tied to a download content or offer the Hubspot system is trained to not ask for information the club has in the HubSpot database. Instead, it replaces the questions they’ve already asked the person with new questions that help continually build the contact’s profile with important data such as special interests, etc. As the contact record is created, the system can be designed to trigger email workflows that help nurture each prospect into becoming a member based on their specific persona, fitness goals and interests, and also nurture existing members into the brand’s personal training and non-dues revenue programming that would be most interesting to them. As soon as a prospect is ready to speak with a member of their sales team, the system routes that lead to the appropriate location’s sales manager or team member and into their Salesforce CRM platform. In 2015, there’s no excuse to market to all visitors on your website using the same messaging, content, and campaigns. Your visitors aren’t one-size-fits-all. So, your website shouldn’t be either. Enter the new trend of “Smart Content” and Website Personalization. Robust “all-in-one” marketing platforms such as HubSpot now power entire websites and enable you to personalize your website content, forms, and CTAs to the unique needs of each visitor, lead, and customer. This technology powering their new site allows California Family Fitness to become more segmented and personalized in their approach to engaging visitors by serving content that’s relevant to them specifically. Doing this successfully will not only result in improved interaction with the content itself but also increased conversions. Anonymous Personalization. From the moment someone “sets foot” on their website, the brand can tailor content automatically based on location, source, or device. Personalize by Persona or Member Status. Once the user has visited one of the persona pages tied to a specific fitness goal as described earlier, a different homepage message or call-to-action can be created when the person comes back to the site making sure that the most relevant content to each is presented first. Personalize by Member Status or Lifecycle. If a prospect or member is in the database, the new site allows them to personalize based on where a visitor is in their buying process, so your loyal members receive a different website experience than first-time visitors. So, there it is, in all of its lead generating beauty. If you have questions about their new site, how it works, the HubSpot website or marketing platform, let us know!